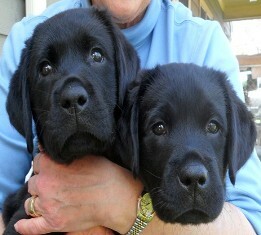 Enroll your pet for Puppy Kindergarten classes, offered by Start Them Right Inc. in Cary or Pittsboro, North Carolina. During class, we teach dogs how to follow basic dog commands very kiindly. A manual is provided to the owners of dogs in our Puppy Kindergarten and Beginner Classes, written by Sherry Dodson, CPDT-KA. The manual not only discusses training, but also theory on why dogs do what they do. It is essential for pet owners to understand this matter. • Training to Walk with a Loose Leash, Sit, Down, Stay, Come, Leave It with distractions. Learn responsible pet ownership while your dog learns good manners. This class will last an hour per week for eight weeks. All dogs who pass the 10-step CGC test at the last week of the training will be eligable to receive a certificate and title of Canine Good Citizen from the American Kennel Club (AKC). In collaboration with Laurie Ray, CMSW, C-ASWCM, Geriatric Care Manager, we offer comprehensive Therapy Dog Training Classes. At the completion of this class, we arrange testing by a Therapy Dogs, Inc. tester/evaluator. Upon passing the test and submitting the proper paperwork, the handler/dog teams are registered as a Therapy Dog Team. Classes are taught at an assisted living facility. Owner/dog team must have CGC certification to enter this class. 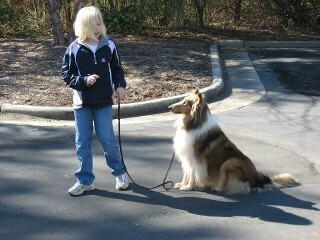 Contact us today in Cary or Pittsboro, North Carolina, to experience our comprehensive dog obedience training class.